Utopia Arkitekter has designed a tent-like shelter that could provide a cosy retreat for trekkers in the mountains. 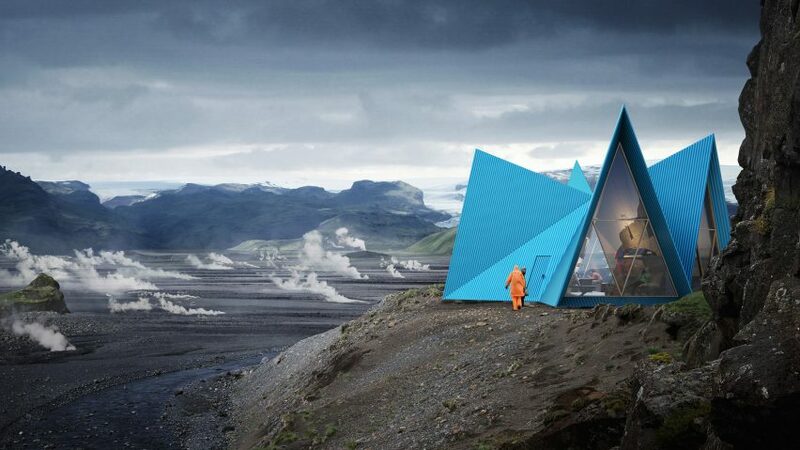 Called Skýli, which means shelter in Icelandic, the conceptual cabin is designed by Stockholm-based Utopia Arkitekter to withstand the extreme weather conditions of Iceland's mountain landscape. Built from both steel and cross-laminated timber, it would sleep up to 15 mountaineers, with additional space to cook, dry clothes and stow gear. Large windows in the gables would offer views out over the landscape. "Skýli is designed for pristine environments where sustainable development is of the highest importance," explained Mattias Litström, founder and creative director of Utopia Arkitekter. "Materials need to be eco-conscious, while also resistant to extreme weather." The project was designed for a competition, calling for cabins that could be used by "backpackers and nomads" in Iceland. Although it didn't win, it is now nominated for an award at the World Architecture Festival 2017, which kicked off in Berlin today. The building's design is formed of four sharply pointed pyramids, intended to give the structure stability and make it visible from a distance. These pitched roofs give the building its tent-like shape. The shape also resembles traditional Icelandic huts, whilst the bright blue is a nod to the colourful architecture of Reykjavík, the capital of Iceland. The colour-coated steel outer shell was designed in partnership with SSAB, a Swedish steel manufacturer. Called GreenCoat, the material is created using a bio-based technology, using rapeseed oil instead of fossil-based oils. It can withstand temperatures below freezing and high exposure to UV radiation, and is resistant to corrosion, making it well suited to high altitudes and mountain weather. The proposed building features two entrances, placed at both the north and south points so that one is always shielded from the wind. The doors are designed to slant inward so that they automatically stay closed, conserving the warmth inside. Inside, Skýli is split into four areas. There are two for resting and sleeping, fitted out with bunk beds and fold-away benches that can double as additional sleeping spaces. The third space is a dining wing, containing a table with benches, while the fourth room accommodates cooking equipment powered by gas. This equipment could also be used to heat the hut in an emergency, although the heat generated by the occupants should usually be enough to keep it at a good temperature, according to the architects. Hooks line the walls to help keep equipment tidy and off the floor, while a compass printed on the floor offers easy orientation. In the gap between the steel exterior and the wooden internal walls, the designers have included a space for visitors to wring out wet or muddy clothes, as well as room for a composting toilet. Rainwater running down the sloping roof could be collected in self-draining tanks in the outer shell, providing the cabin with water that could be used for washing, or purified for cooking and drinking. Solar panels and a battery offer enough power to charge devices and light the interior in good weather. A hand-crank generator would provide a backup on darker days, but would also double as an emergency beacon if occupants needed to call for help. In the case of an emergency, the cabin would be kitted out with basic medical supplies and a stash of food rations, stored under the benches in the dining area. Both the inner shell and the furniture – designed to fold flat for ease of transportation – would be made from cross-laminated-timber (CLT), a high-strength engineered wood. Combined with the lightweight steel shell, it would make the cabin easy to manoeuvre into position. The CLT and steel would also provide insulation, along with the triple-glazed windows. “The original concept was developed to be easily transported to remote locations, therefore, utilising lightweight materials is very important,” explained Litström. A series of plinths would lift the structure off the ground, providing it with a flat and stable base, whilst minimising its impact on the natural terrain. The designers imagine all components being pre-fabricated so that they could be transported flat, winched underneath a helicopter and constructed in situ – a process Utopia Arkitekter estimates would take between two and three days. Other designers that have developed designs for mountain hideaways include Slovenian studio OFIS Arhitekti, who have previsouly built a CLT and aluminium hut in the Alps and LEAPfactory who previously cantilevered a tube dwelling over the edge of a mountain.